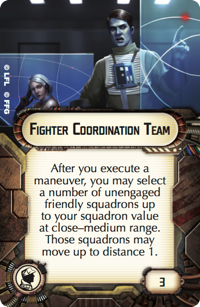 Greetings, Star Wars™: Armada fleet commanders! 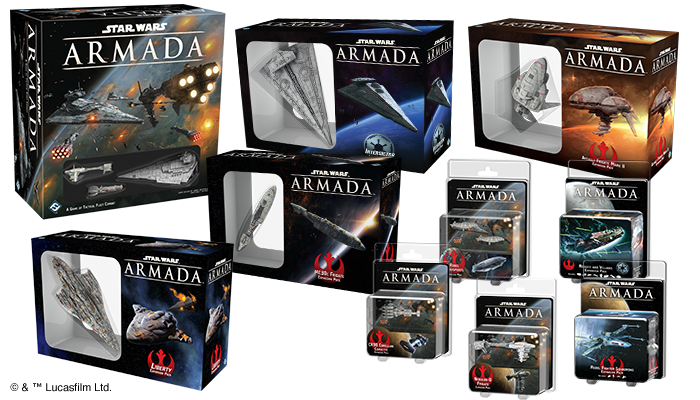 The final results of the Star Wars: Armada Fleet Commander Contest are now in. After sorting through hundreds upon hundreds of creative fleet designs, our developers selected four to play against each other in an in-house tournament. Last week, we presented the semifinal results. 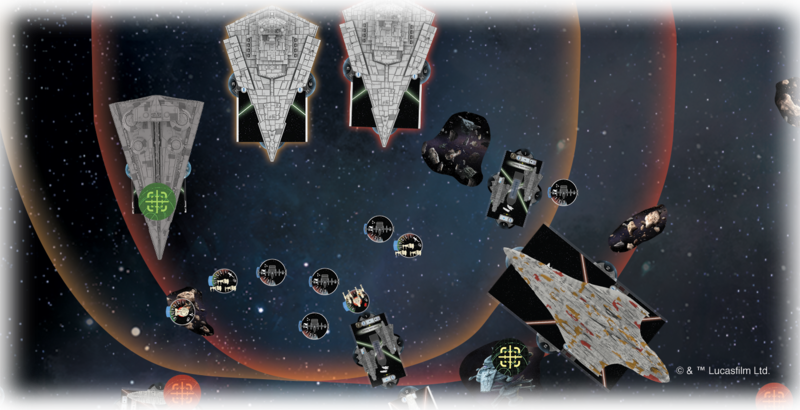 In Game One, developer Max Brooke commanded Alexandra Smith's top-seeded Imperial fleet to victory against the Rebel fleet designed by Adam Pye and flow by producer Michael Gernes. 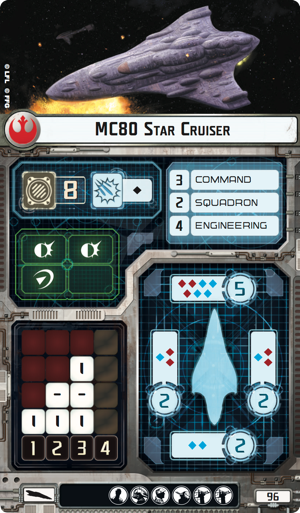 In Game Two, developers Sam Stewart and Alex Davy fought a nervy, tactical battle in which Sam ultimately eked out a victory with Craig Lincoln's Rebel fleet. Both Alexandra and Craig had built their fleets at 398 points, so Max and Sam rolled to determine who would be first player. Sam won the roll, but decided that because Alexandra's fleet had so many activations, he would go second. This meant the game would use one of Craig's objectives, but more importantly, Sam hoped it would force some of Max's forces to come at him early. If they did, he might be able to catch them in his big guns, score some points, and then fly to safety, making good use of the fantastic maneuverability granted by General Madine. This was the strategy that Sam had employed in his match against Alex in the semifinals, but Max came to the battle with a fleet full of tools to hinder the Rebels. 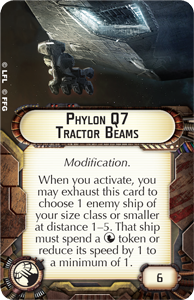 With Admiral Konstantine, a G-8 Experimental Projector, and a pair of Phylon Q7 Tractor Beams, Max was well-situated to cut down on Sam's maneuverability. 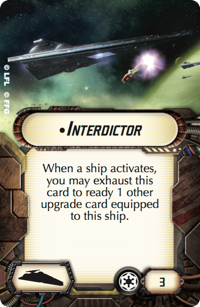 As incorporated into Alexandra's Imperial fleet, the Interdictor offers a potent blend of firepower and tactical control. 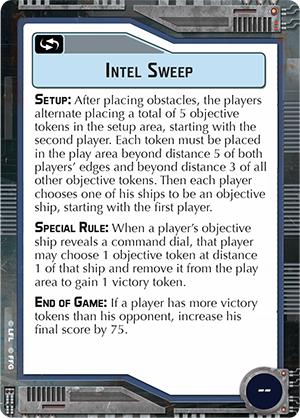 After determining that the match would use the Intel Sweep objective, both players set up their forces. The obstacles were set up in an arc across the middle of the board. Sam deployed three objective tokens in a line paralleling his board edge at distance five, while Max weighted the left side of the board with the other two objective tokens. Sam then chose the Bright Hope as his objective ship, while Max chose a flotilla of Gozantis. He then used his Gozantis and TIE Fighter Squadrons to tease out deployment, forcing Sam to commit the bulk of his forces early. In response, Sam deployed the Yavaris in the center of the board with the full complement of fighters, placing Mon Karren on the right flank and the MC30c Torpedo Frigate on the left. The Bright Hope was set up to run parallel to Sam’s board edge from left to right, with Sam making an obvious bid to snap up a majority of the tokens. In response, Max placed his two Victory I-class Star Destroyers and the Interdictor opposite of the Yavaris in tight formation. 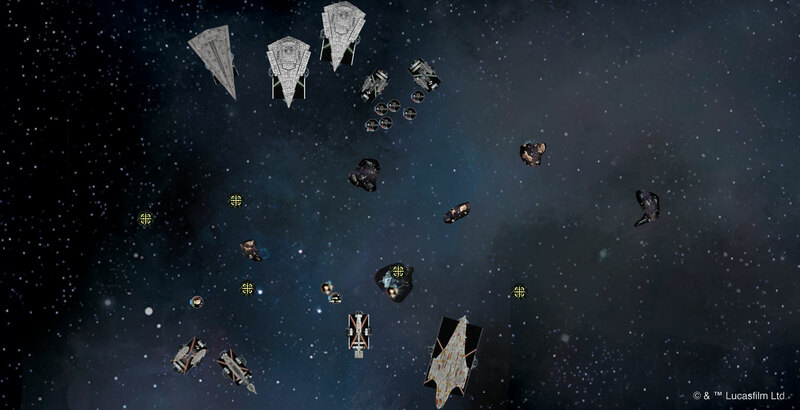 His objective Gozantis started somewhat apart from the main fleet, preparing to make a run on Sam’s token line and prevent Sam from scoring them. Sam says, "My plan was to pincer Max’s gun-line between the MC30c and the Mon Karren, with the Yavaris in the center. I knew I wouldn’t be able to outrun his TIE fighters, so my hope was to outfight them with Yavaris’s help. That’s what ended up happening, but by the time the TIEs were dead, I didn’t have much of a chance to deal major damage to his ships." Sam began putting his plan into action in the first round, claiming an objective token with the Bright Hope and swinging his MC30c around the left side of the board at speed "4." The Mon Karren pulled a hard turn to the left, hoping to get into a flanking position. And the Yavaris advanced up the middle at speed "2," moving its fighter complement forward with the help of Fighter Coordination Team. Of course, Max had fought against a fighter-heavy fleet in the semifinals and was aware of the threat they posed his ships. 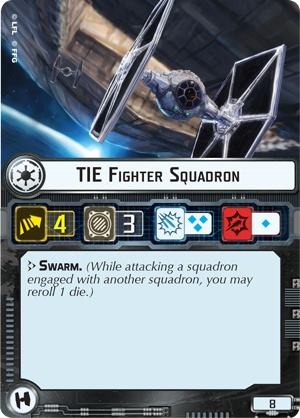 "Having learned from some of my mistakes against Mike, such as allowing him to use the Yavaris and its cohort of Rebel all-stars to sink a Victory almost immediately, I made sure that I was able to get my TIE fighters into position to block off Sam’s Yavaris alpha strike." Meanwhile, Max advanced steadily with his Interdictor and Star Destroyers, sending them forward at speed "2," while running his objective Gozantis wide to the left in the hopes of slipping past the Mon Karren. He kept his other Gozantis closer to main force for fighter control. The battle began in earnest in the second round, as Max sent his TIE fighters to engage Sam's B-wings. After all the shots had been fired, Max had lost one TIE Fighter Squadron, and Sam had lost one B-wing squadron. 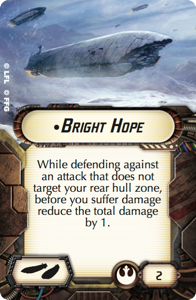 Meanwhile, Sam misjudged the Bright Hope's movement and realized it would not be able to score the second objective token on its next pass. Still, it was not all bad news for Sam. 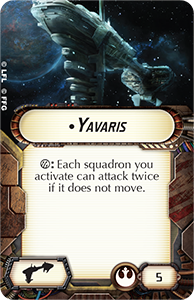 The Mon Karren landed a critical hit on on Max's secondary Gozantis, while Max's objective Gozantis ended their movement stuck within the Mon Karren's front arc. 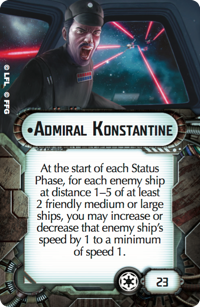 Perhaps, the most important development from the early engagement, however, was that at the end of round two, Max realized that the Mon Karren was at distance "5" of both his Victory I-class Star Destroyers, and that meant Admiral Konstantine could reduce its speed to "1." So he did. Now the Mon Karren and Max's Star Destroyers were locked in close range of each other, and the big guns started firing on both sides. 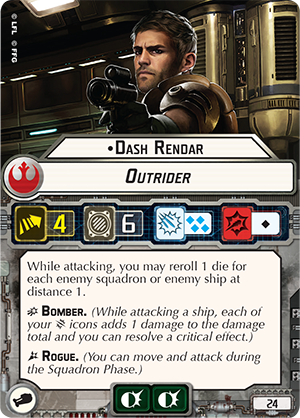 Over the next couple rounds, Max's TIE fighters took out the other B-wing squadron, "Dutch" Vander and Dash Rendar eliminated the TIE fighters, and Max's Gozantis snatched away the second objective token from right under the nose of the Bright Hope. Of course, the damage that the big ships piled onto each other added up quickly over these rounds, and at the end of the third round, Max once again used his tricks to slow the Mon Karren, limiting it to a forward crawl at speed "1" that left it squarely in the forward arcs of both his Star Destroyers. With the three biggest battery armaments in the sector aimed all right at each other, the fourth round was one of total devastation. While Sam's Yavaris and Mon Karren ripped through the Star Destroyers' shields and piled up damage on their hulls, the Star Destroyers retaliated against the MC80 Star Cruiser and destroyed it. This was also the round that, after having its speed reduced at multiple stages, Sam's MC30c managed to maneuver into range of both Victory I-class Star Destroyers, catching one of the heavily damaged ships in each of its side arcs. Accordingly, Max opened the game's fifth round by activating the more heavily damaged of his Star Destroyers, using it to finish off the Yavaris, and maneuvering it out of the MC30c's punishing side arc. 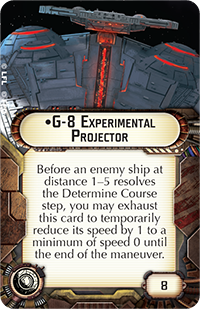 The MC30c Torpedo Frigate then finished off the other Star Destroyer and tried to catch up with the other Victory, only to be held back by the Interdictor and its G-8 Experimental Projector. 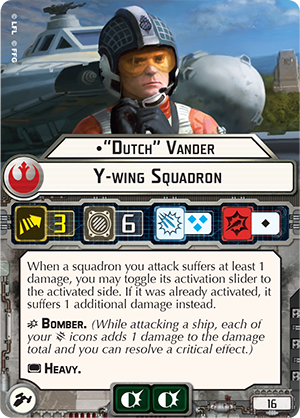 Still, "Dutch" and Dash were able to deal some damage to the remaining Victory, and the Bright Hope raced forward to claim its second objective token. 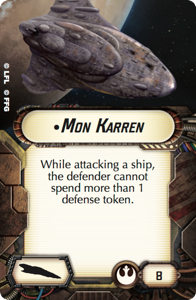 The obvious centerpiece of Craig's fleet, the Mon Karren is capable of dealing punishing damage to any ship caught in its forward arc. At the top of the sixth round, everything was still wide open. Having destroyed the Mon Karren, Max was well ahead on points, but his remaining Victory was barely holding together. 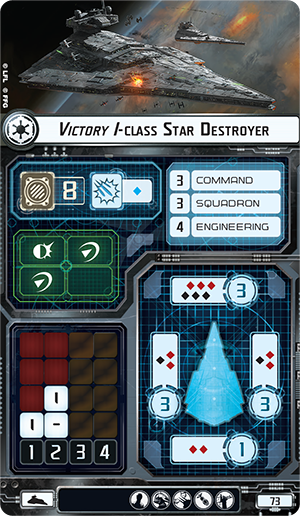 As a result, Max chose to activate the Victory first, but due to the position of the Interdictor, he was unable to get it out of range of Sam's MC30c. 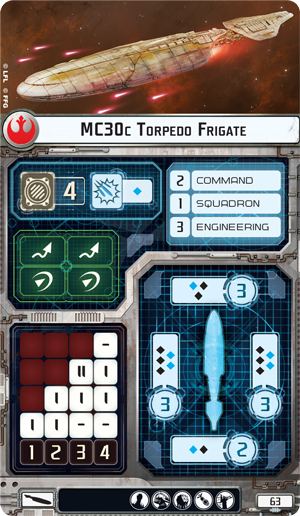 The resulting MC30c fire generated a crit, activating its Assault Concussion Missiles, and the shot overloaded the Star Destroyer's remaining shields and ripped through its hull, removing it from the game. 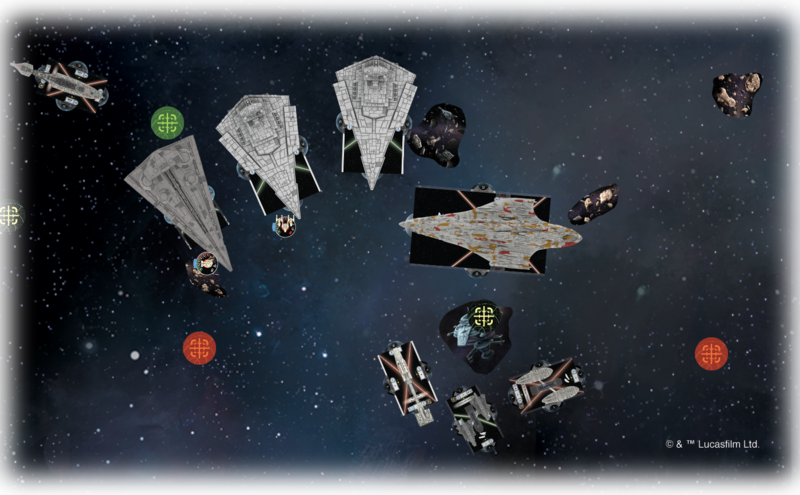 This left just the MC30c, the Interdictor, a couple of squadrons, and a pair of flotillas. 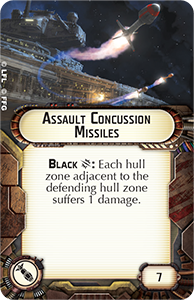 And even though the MC30c was unable to avoid a collision with the Interdictor, it still managed to survive the final volley, making the jump back into hyperspace at the end of the game with just two hull remaining. At the end of the game, then, Max had destroyed the Mon Karren, the Yavaris, and a couple of squadrons. Sam had destroyed both of Max's Star Destroyers, along with one flotilla and all of Max's TIE fighters. This meant the two players were separated by only nineteen points of ships destroyed. Ultimately, it was the Bright Hope and its pursuit of the objective tokens that ended up sealing the win for Sam and Craig Lincoln. Sam says, "This ended up being another really close game, and had it gone on one more round, I guarantee the Interdictor would have destroyed my MC30c. As it was, going second gave me the objective setup I needed to claim two tokens, which ended up being my key to victory." 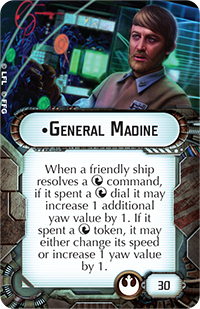 He also credits Craig Lincoln for the inspired decision to crew General Madine aboard the Bright Hope instead of the more heavily shielded (and obvious) Mon Karren. It was not a move Sam would have made on his own, but he says, "Madine managed to survive both of these games, so kudos to you, Craig!" As for the rest of our Fleet Commander finalists? Alexandra and James Lockwood each win a copy of the Interdictor Expansion Pack and Imperial Assault Carriers Expansion Pack, and Rebel fleet admiral Adam Pye wins one copy each of the Liberty Expansion Pack and Rebel Transports Expansion Pack. We also selected four random prize winners from the rest of the Fleet Commander participants. Ian Sanderson, Jack Wade, and James Wilks each win a copy of the Rebel Transports Expansion Pack. Nigel Gray wins a copy of the Imperial Assault Carriers Expansion Pack. The winners may have won the biggest prizes, but we want to thank everyone who participated in the Star Wars: Armada Fleet Commander Contest. You have made this an exciting and entertaining way to see the Wave III and Wave IV Armada expansions in action, and we look forward to seeing more of them on your tables shortly. To that end, if you are headed to Gen Con Indy, be sure to stop by our booth. We will have early copies of all the Wave III and Wave IV expansions. But even if you cannot make it to Gen Con, you want to make sure to pre-order your copies today. Both Wave III and Wave IV are scheduled to arrive at retailers later in August!